Richmond, VA - February 13, 2008 - Like Thought is proud to announce Opacity 1.0, their innovative new editor for screen graphics, exclusively for Mac OS X 10.5 Leopard. Opacity has traditional graphical features like vectors, layers and filters along with exclusive features including variables, templates, factories and much more. By leveraging the power of Core Animation and Quartz, Opacity combines all of the tools artists need to create beautiful images for the icons, applications and the web. Opacity streamlines the image creation workflow by combining a great vector editor and pixel editor with native support for all the formats needed for the screen. Opacity is also ready for the future with support for easily preparing graphics for resolution independence. Opacity's vector support includes paths, gradients, lines, text, and more. With vectors, users can create images that look great at any resolution. Opacity takes this even further with special features like automatic pixel aligning and resolution variables to automatically hide details at low resolutions. With pixels tools including pencil, eraser and fill, it's easy to make images pixel-perfect at every resolution. Opacity also supports layers, including folder layers. Every layer has its own opacity, blend mode and mask. Filters in Opacity are live layers that can be added to images (with their own masks) and dynamically changed at any time. Opacity also includes many unique new graphic editing features. Previews make it easy to see how an image will look when deployed. 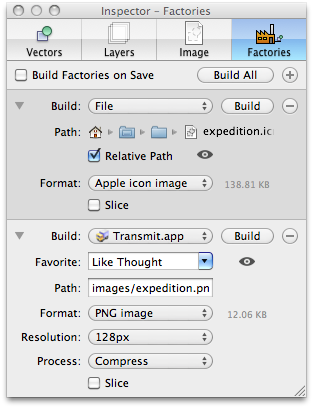 Exporting images in Opacity only takes one click with Factories. With Frames, an image document can hold multiple images, either as an animation or as a set of related images that can be exported together. Variables can be assigned to vectors, filters, layers and more to allow creation of powerful dynamic images. Opacity has lots of little details to make creating images a joy. With Math Anywhere, any equation entered into a numerical field will automatically be evaluated to its value. Undoing an action highlights the change that occurred with a subtle yellow fade. Transforms make it easy to rotate, scale, translate, flip and shear an image or its components. A free trial version of Opacity is available for download, and the full version costs $89 USD. Opacity requires Mac OS X 10.5 Leopard and is a Universal Binary for PowerPC and Intel Macs. Like Thought is a small independent Mac shareware company. It was founded in 2006 by Jacob Godwin-Jones in Richmond, VA. Like Thought has released Lexicon, a language learning application, and Opacity, an editor for screen graphics. Like Thought is dedicated to making high quality, user friendly Mac OS X applications. "We really like prMac. At first we decided to use the service in a rush just to save time. But it turned out that prMac service is exceptionally useful and really worth it. And customer support is outstanding! That's why from now on prMac is our default choice." See Our Podcasts on iTunes! There are 12503 Members. Register today! Print this page | PDF | TXT | Read other releases by this member. "I have used prMac for the release of my company's products and have found their service to go above and beyond, what can only be considered as, exceptional. They have been extremely quick to offer help and assistance and offer a truly personal service, which as a business owner, has proved invaluable. I have no hesitation in recommending prMac and will continue to use them for future releases."